With noting 7.5 points, he spoke of them all in detail and passion, encouraging us to be accountable to ourselves. For myself, I found quite a few points that have stuck with me regarding goal setting. Many of us want to think the best of future selves when we need to focus on our present selves; “what we do today, we will do tomorrow”. For example, with this article, I wanted to believe that I could in fact write it within the week after Dr. Williams’ talk and the congress, but I feel l knew subconsciously that once back in regular work/family life I would find that task very challenging. I needed to adjust my goal, but still complete it. Goal setting versus goal attainment are two different things. If we give ourselves things to do each day (towards those goals) and do them consistently every day, they will become a habit after 21 days and help us reach our goals. Belief in others can be your strongest power. Some of your colleagues may or may not have someone that believes in their potential, be that person! You need to verbalize that to them, not just once but continuously. To say those words to someone could change lives. Set goals with them, hold them accountable, meet with them to review, invest your time in their time. “The choice you make today will be the same choice you make tomorrow”. Write these goals down, as Dr. Williams spoke “it says something when you make the effort to put pen to paper and memorize it”. Repeat it each day, become these words. This will build your work culture into a two-way street; by treating your colleagues with zeal they will in turn treat your guests with the same zeal. As your colleagues are in fact your first and longest guests that you will encounter. Protect their zeal as well as your own and cultivate it by paying as much attention to them as you can the guests. Believe that they are the most capable team and they too will shine. When discussing excellence, you do have to touch on those that are not. Dr. Williams notes “indifference is the opposite of excellence”. It is a weed that can kill your plant (your work environment), you need to demonstrate what you want, celebrate your culture and refuse to tolerate anything less than the level of service that you expect. Talking and showing your colleagues often and inspecting them every chance you can, so that they can do better and become better. You should not be the last one to know if a procedure does not work. Keep your standards unapologetically high. Dr. Williams left us all eager to serve, not only our paying guests, but our colleagues. He taught us that it is alright to be unreasonable about certain things, that we should treat our workplaces as sacred space as they have us in them. We, as individuals, are unique and special, place us together and we become a strong link. The chain will not break where we stand! The chain will not break where I stand! Thank you to Dr. Bryan Williams for his wonderfully energizing talk to our organization. It is one that resonated with all of us. 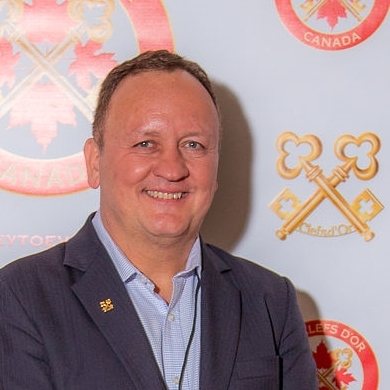 ← Carolina Avaria just completed 10 years of service on the Executive Board, including 5 years as President of Les Clefs d’Or Canada. Fantastic! Thank you for posting.